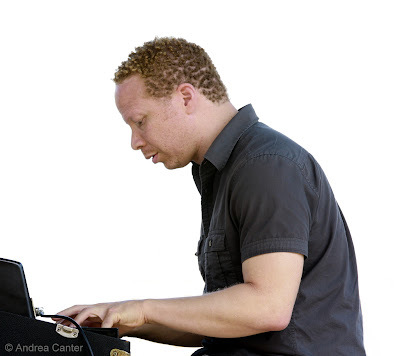 On June 7, Downbeat Magazine’s 2010 electronic keyboards “Rising Star” Craig Taborn will celebrate the American release of his first solo piano recording, Avenging Angel, on ECM. Totally acoustic and totally improvised, Avenging Angel may surprise those Taborn followers who are most familiar with his electronic wizardry and dual-keyboard gymnastics with such leaders as Tim Berne, Chris Potter, Michael Formanek, Roscoe Mitchell, and Evan Parker. And similarly, the free nature of the new project might surprise his early-career fans who recall his acoustic mainstream work with James Carter. Or maybe not. Ever since his first recordings as leader or sideman, Taborn has impressed critics and general listeners with his unique approach to his instrument and its sonic vocabulary, whether following lyrical melodic themes or creating thunderstorms of dissonant chords, often while playing Fender Rhodes (or laptop) and acoustic keyboard in tandem. And after hearing Avenging Angel a few times, I was eager to ask Craig about the notion of a solo acoustic recording and his approach to improvisation in this context. AC: What led you to record solo, and on acoustic piano? Had you resisted the idea of solo in the past? AC: Regarding where the ideas came from, you say you “just start.” But what leads to that first note or set of notes—that first idea? Is it a spontaneous thing or are you (sometimes) taking something that you have been hearing in your head (or in your environment) as a starting point? “Well, the instrument is always a crucial factor in what music ultimately emerges because, despite any clear musical ideas one may have in the moment, and beyond the ability to technically render this, the piano's character will color the music. Also the condition it is in will enhance or compromise one's own proficiencies. The instrument in the Lugano studio was simply a very well maintained and great instrument--very responsive with a full sound but also not yielding too easily. It makes you work for things, which is crucial with improvisations because you are always forced to weigh your decisions against their difficulty as well, which can help in real time editing of ideas. AC: Often you plays two instruments on a gig, acoustic and electric keyboard, sometimes one hand on each. I read in a recent interview where you said "I'm trying to hear multiple ideas all the time. A lot of that is an extension of things I heard Sun Ra do.” So when playing solo here, are you pursuing multiple ideas simultaneously with left and right hand? Or is your approach totally different when it is just one instrument? AC: Do you find yourself coming back to some of the soundscapes you created for Avenging Angel in other contexts (like when you are playing with other bands)? Avenging Angel is indeed effective and meaningful music, revealing not only details of the sonic potential of the piano but insight into the creative mind of Craig Taborn. See review of Avenging Angel on Jazz Police. Photo: Craig Taborn (at the Iowa City Jazz Festival)--and no, that is not an acoustic piano.